A single place to manage all your test executions and test plans within a project. You can now manage all your test executions and test plans from the new test executions index. When "Assigned to me" is selected it shows the list of test executions and test plans assigned to you. 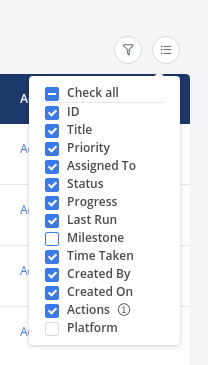 Depending on the status of a test execution and the rights the currently logged-in user has , a set of actions would be made available when someone clicks on the "Actions" column of the row. Note: Test execution details can be viewed by clicking on its title. Delete : If user has rights he will be able to delete the test plan along with its test executions. List can be filtered on default criteria and the custom fields that are searchable. 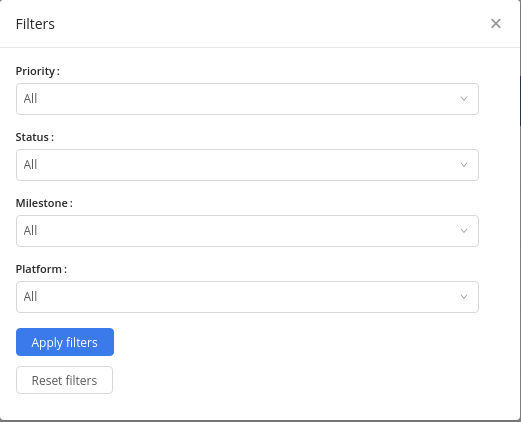 As in the image here, Priority, Status and Milestone are default filter criteria while Platform is a custom field included as criterion. The applied filters can be reset using the button available. You can show or hide one or more columns in the list. The test executions and test plans can be sorted in ascending or descending order on ID, title, priority, time taken and creation date.